Grate peel and squeeze 2 tablespoons juice from orange; reserve juice. Combine orange peel, cilantro, paprika, and ground red pepper, if desired, in small bowl. Cut beef Steak into 1-1/4-inch pieces. Place beef and 2-1/2 tablespoons cilantro mixture in food-safe plastic bag; turn to coat. Place remaining cilantro mixture and fruit in separate food-safe plastic bag; turn to coat. Close bags securely.Marinate beef and fruit in refrigerator 15 minutes to 2 hours. Place kabobs on grid over medium, ash-covered coals. Grill beef kabobs, covered, 8 to 10 minutes (over medium heat on preheated gas grill, 9 to 11 minutes) for medium rare (145°F) to medium (160°F) doneness, turning occasionally. 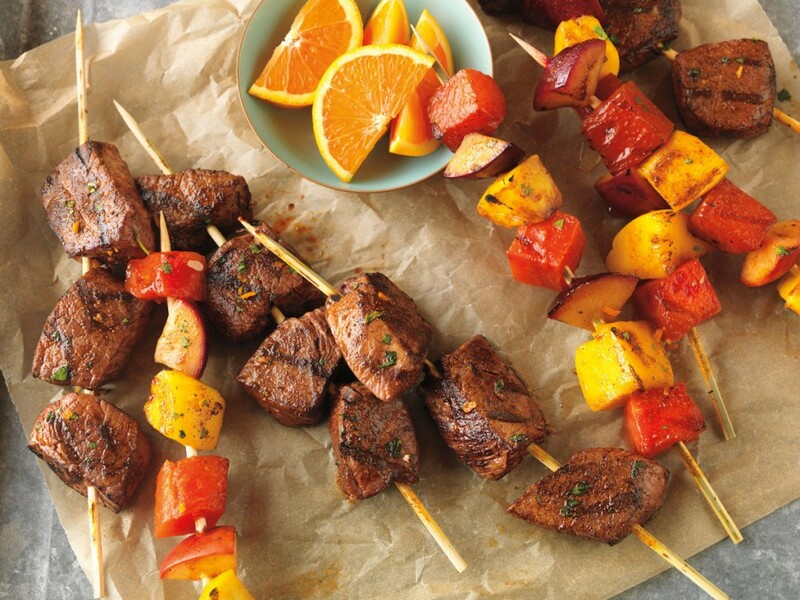 Grill fruit kabobs 5 to 7 minutes or until softened and beginning to brown, turning once.